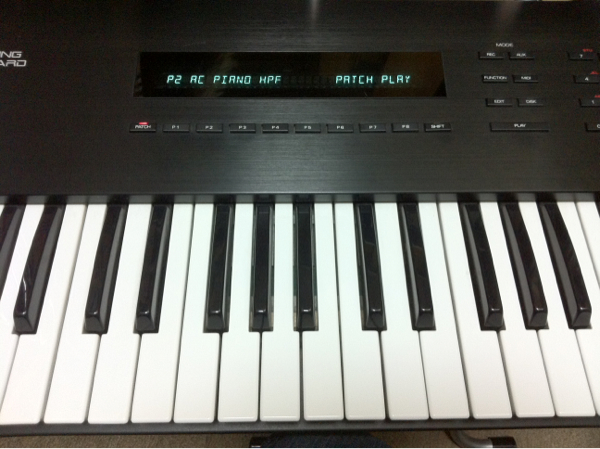 Today I found a prestine condition Yamaha V-50 at the local used music and audio store in Nagano city. I already have two Yamaha V-50 synthesizers so I REALLY didn’t want to buy a third. What caught my eye other than the $30 dollar price tag was the fact that the Yamaha V-50 was bundled with documents and DISKS!! We all know that synth accessories can be very difficult to acquire and are usually expensive on Ebay for example. Bundled with this Yamaha V-50 was a mint condition MCD64 Ram card with the box and the original wrapping. It probably was rarely used. 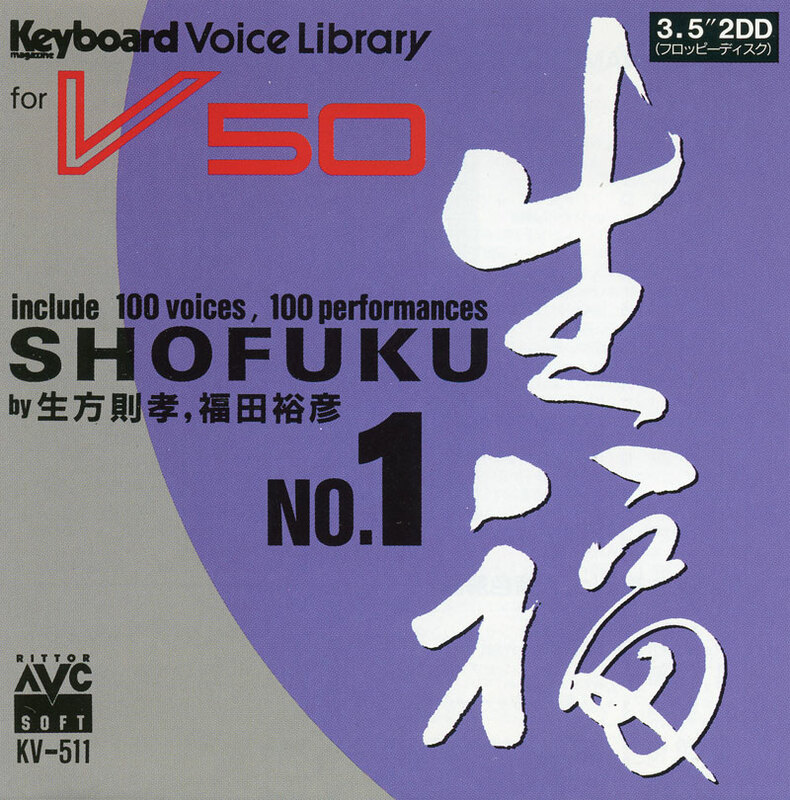 Along with the Ram card was a Keyboard Voice Library CD case with a 3.5″ 2DD floppy inside titled “SHOFUKU NO.1”. The disk apparently had 100 voices and 100 performances on it. The Floppy was produced by Rittor which is a publishing company I’m familiar with in Japan. The same company distributes the Japan Guitar, Keyboard, Bass, and Drum Player magazines in bookstores here. Anyway, I decided to buy the Yamaha V-50 basically to get acquire the MCD64 Ram card and to try out the SHOFUKU No.1 disk. Indeed the Yamaha V-50 is in mint condition and even the floppy drive works great. It probably needs the battery changed likely soon as my other two needed to have that done shortly after I purchased them. For 30 bucks, I felt it was a pretty good price to get the Ram card, Shofuku Disk, and a V-50 for parts or to sell in the future. When I got home I fired it up and everything worked great. I tried out the Shofuku No.1 disk and WOW! It totally changed everything on the V-50 for me. The guys who developed the Shofuku sounds which are dated 1989 by the way really did a fabulous job on the synth and bass sounds. They also did a great job on programming some cool Industrial drum hits that could easily be used for something like Information Society type stuff. The performances are heavily layered which really adds to the thickness of the FM sounds and add a sort of motion feel to them. The SHOFUKU series also extends to the SY series but am not sure about those sounds. If anything, the SHOFUKU NO.1 sounds added an enormous amount of inspiration to jam on the Yamaha V-50 once again. I’ll likely use a looper or recorder instead of the on board sequencer due to polyphony, but that’s what I do quite a bit lately anyhow. Layering on the V-50 is actually quite good and I highly recommend trying it out if you have a V50. It might breath new life into the synth. I also need to revisit the Yamaha V-50 librarian situation to see if I can also save the SHOFUKU data to sysex format. I tried searching for this set on the web, but couldn’t find it. Also note that the retail price on the SHOFUKU was 6,000 yen back in 1989. I paid less than half that for the sounds PLUS the V-50 and MCD64 card altogether. My have times changed and of course some luck had to be thrown in…smile. I was very busy over the New Year Holidays, but found a spare moment to run into one of my favorite used music shops called “Hard Off” here in Nagano-city, Japan. To my surprise, I found a bundled Roland S-50 for $10 bucks! Geez, I’ve been tinkering with my other one for ages with the Static Output problem and so I thought Wow! Might I get lucky and find a Roland S-50 in perfect working order? Well, not quite. I actually found the Roland S-50 to have “almost” the same static output problem as my other one. However, what’s different is that it outputs static across the entire polyphony range instead of just a couple of voices on the my other one. What came with the Roland S-50 became a bit more rewarding after I found the Roland S-50 to be a bit flawed with the distorted output. Bundled along with it was the original Roland stand sold with the S-50 long ago in Japan. It also had the Roland DT-100 with Stylus pen in perfect condition. Plus the SYS-503 Sequencer dongle along with disks and manual thrown into the mix. Finally, I snagged an RGB cable, but still requires an old monitor which I don’t have. I didn’t think to look for it in the store so I might go back just in case. These days, any vintage GK, RGB, RC cable is valuable in the Roland world. The Roland S-50 itself is in mint shape. So I also figure I have a spare display, floppy drive, joystick, and other spare part inventory now for the Roland S-50. As I reported back in my earlier articles about the Roland S-50, there is a major static or distorted output issue on many units. What exactly is the cause I am not 100%, but I can say that cleaning the Relay has pretty much reduced if not negated all static output for a short while. There also is a 3-way toggle switch on the back that adjusts the L/M/H level output of the S-50 which when wiggled can cause instability as well. However, I found the toggle switch had no direct connection to the static output as it appears to be a “post” audio leveler adjustment. Something tells me, the issue is likely very simple, but unfortunately I’m not quite at the level of expertise nor do I have all the tools to diagnose the problem. Until then, I feel the S-50 will not see the stage until I can get it more stable. Beware for anyone looking to buy a used Roland S-50. In my research, I have encountered a significant number of Roland S-50 Samplers with the Static/Distorted output issue. Be careful when buying one because the problem is becoming more of a common one and there is no 100% fix yet. Cleaning the relay helps. I also found turning down the volume and raising the gain on the mixer to help quite a bit as well. I play hard on the keys so the distorted output really stands out when the pressure is on the keys more. If you play softly there is almost no issue at all. Of course it’s rather difficult to jam playing softly…laugh. With that said, the addition of the DT-100 and SYS-503 dongle are wonderful. If one day I get the Roland S-50 static issue solved, I no doubt will go gang busters with it because I simply LOVE the sound it produces. Here is a recent video uploaded to Youtube that I found to be an excellent demo of the Roland S-50.